I have frequently been saddened and shocked by the furious anger that some cyclists express when the subject of electric bikes come up. Bizarrely, they seem to think that electric bikes are more of a problem than cars, and certainly should not be allowed on bike paths. In fact, electric bikes are just another kind of bike. People who have them bike further than people who buy regular bikes, and become much fitter than they would have if they were driving instead of ebiking. Electric bikes make the fun and health benefits of cycling accessible to almost everyone, and that is a wonderful thing! Many of these angry cyclists are coming from a good place, even they express it very unkindly – they care about the planet. But the anti-electric bike group miss a lot of important points. First of all, the best thing about electric bikes is that they make cycling accessible for more people. And that is the goal, isn’t it? Get as many people out of cars as possible, and create a world where there are so many bikes that city planners will have to design cities that meet cyclists’ needs. My dog Ripley is a big fan of electric bikes! 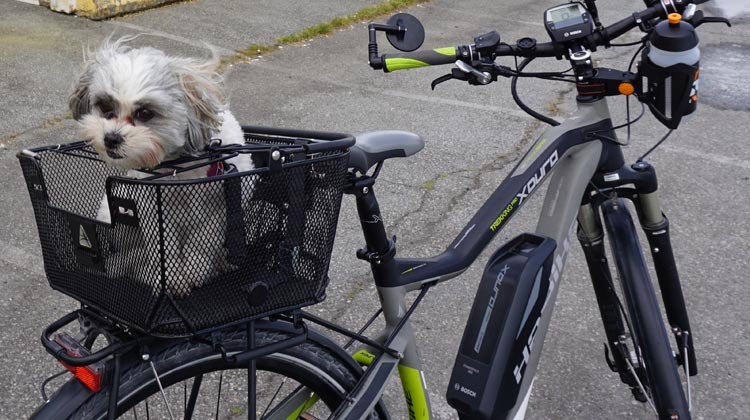 So electric bikes make cycling possible for dogs too! Well … they make it easier to transport your dog, anyway. Definitely not sweating that extra 8.5 pounds of Shih-tzu and 2 pound Axiom pet basket (reviewed here)! Electric bikes are an incredibly exciting innovation that will ultimately broaden the community of cyclists. This is because they make cycling possible for average people – not just the lean, young, able-bodied, fit minority. I cycle commuted for ten years, but I stopped when I had a serious injury. I missed cycling, and finally got my doctor to agree to my cycling IF I used an assist to make sure I did not over-do things. I had my trusty Devinci hybrid commuter retrofitted with a fabulous Bionx electric bike kit, and I was off and pedaling. 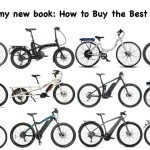 (Click here to read my review of the BionX electric bike kits.) After just over a year of cycling with an electric bike, I was ready to go back to regular biking. Nowadays I still use my electric Haibike to get to work, because I have a massive hill to get over, and the round trip distance is 44 km. The difference between me and my co-workers who cycle to work on regular bikes: I do it EVERY day, while most days they are daunted by the giant hills, and so they drive in, instead. So I do two hours of assisted cycling, while they do two hours of driving. There is no doubt who is getting the health benefit, and who is causing less pollution. Note that this bike functions as a Pedelec – I have to pedal to make the engine work. From there, I choose the level of assistance – from zero to turbo, depending on terrain and the state of my knees. The Emotion Street 650 that my wife Maggie (Mrs. Average Joe Cyclist) rides, works on the same basis. When she gets home from work on it, she is dripping with sweat. But on a regular bike, she could not manage the commute at all. We live on a river, at the bottom of hills so enormous that it is hard to WALK up them. 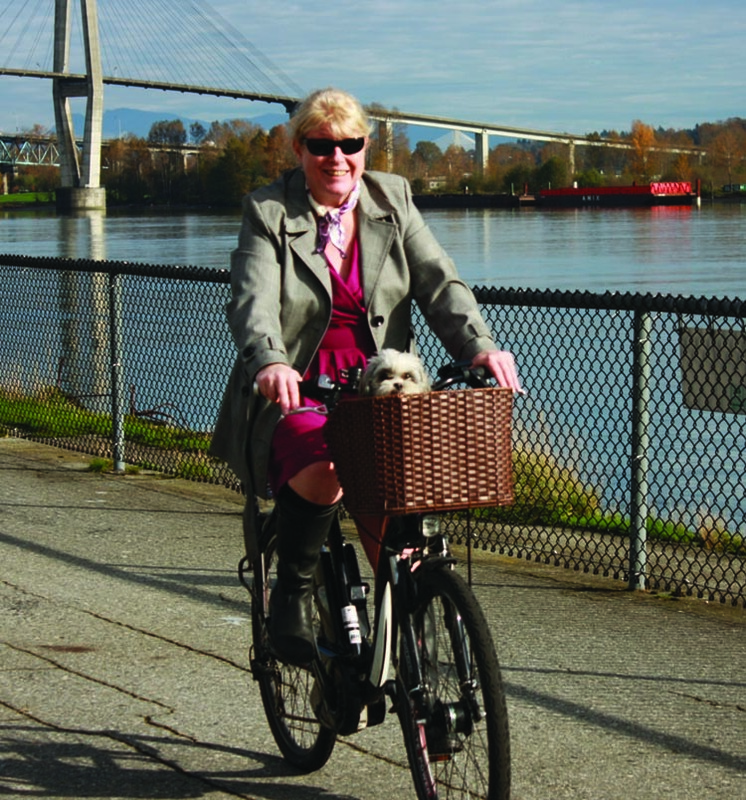 Ten years ago, Maggie was afraid to bike after major back surgery. I couldn’t blame her – before the surgery she could not even dress herself, and was frequently in excruciating agony, so no wonder she didn’t want to risk hurting her back again. She dared to try it only because the BionX electric bike kit on my Devinci made it feel safer and easier. 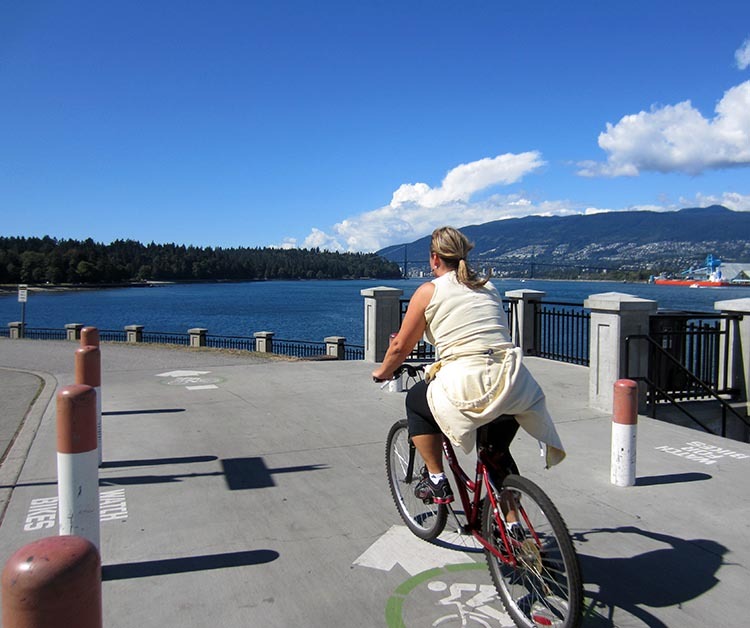 Since then we have done bike riding tours such as the Galloping Goose Trail that require 130 km of cycling, loaded up with full panniers – without an assist to be seen for either of us. Lately she is using her electric bike more and more, so that step by step, she is becoming car free. So … electric bikes are good for the environment, because people who own them actually use them – while not using their cars. 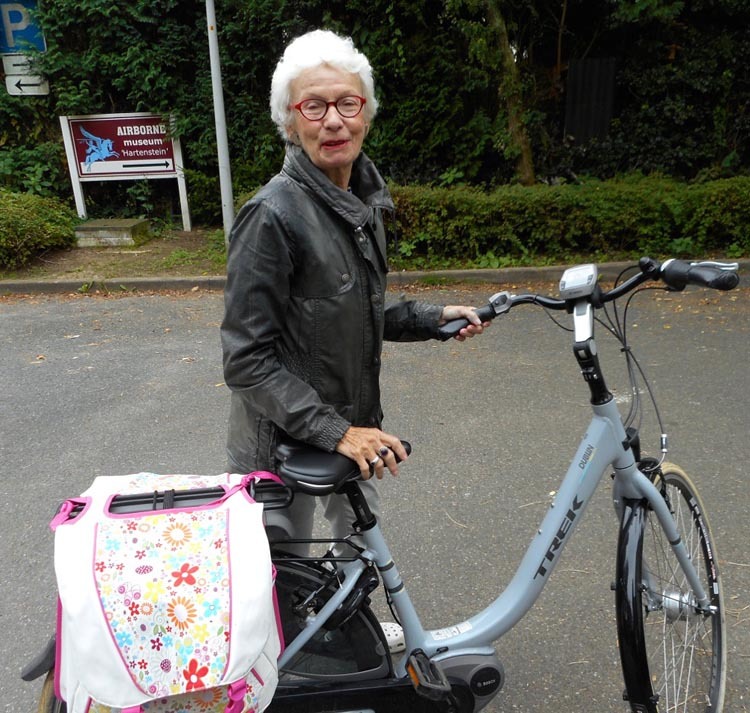 People travel twice as much on the electric bike … The effect of having an electric bike was particularly strong among women. Electric bikes helped Maggie and me to get back into shape, and get fit and confident enough to go back to regular bikes. We are relatively lucky – there are many people who will never be able to get back on regular bikes, because of health conditions, or old age. But isn’t it better that they ride an assisted bike, rather than not be able to cycle at all? 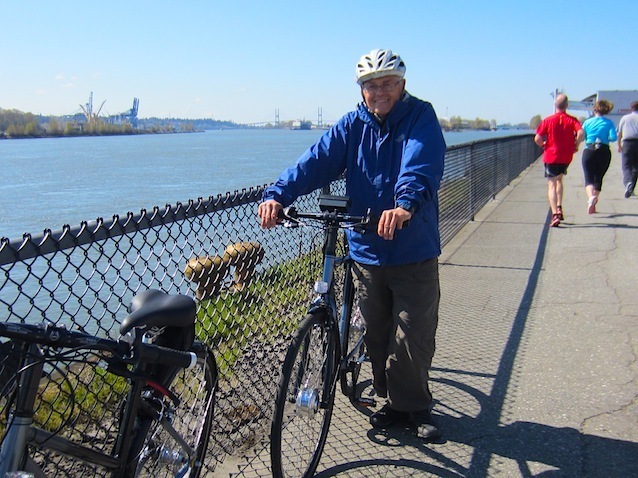 For example, retired engineer Ron Wensel in Ottawa spent his entire working life commuting by bike to work, then retired, and then had four heart attacks. His doctor banned him from cycling because all of his heart attacks happened when his heart rate got over 140. Most people would have given up. But Ron did not – instead, he built his own electric bike, hooked it up to a heart rate monitor, and now he still does bike tours all over the world on his bike with his wife – completely contrary to what his doctor predicted! He uses his bike like a regular bike until his heart rate gets to the danger zone, then he switches on his assist. The Ottawa Heart Foundation has had Ron come and speak to them, because he is a model of how heart disease can be treated with sensible, controlled exercise. Ron liked his bike so much that he now manufactures and sells them with his son, under the brand name Pedal Easy. 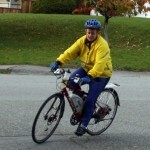 Click here to read my indepth review of Pedal Easy, made-in-Canada electric bikes. 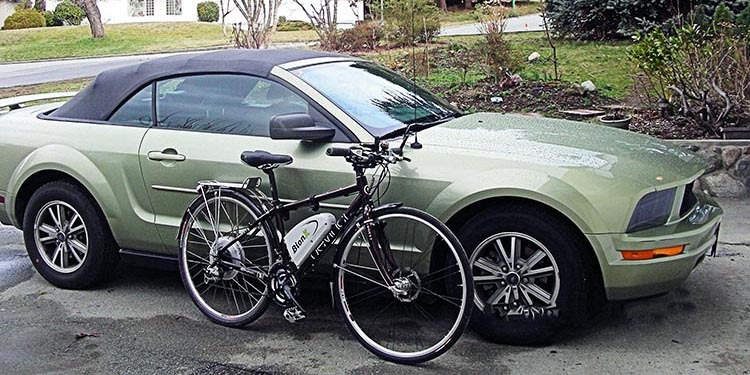 Click here to read how Ron proved that you can burn almost as many calories with an electric bike as with a regular bike (underscoring my point that you still get exercise on an electric bike). The electric assist is only an assist – on electric bikes, pedaling is still required, sweat is still generated, and fitness is still built up. I sometimes see electric bike commuters zooming past me using throttle only, not even pedaling. This does not cause me to froth at the mouth in fury because they are “cheating.” Live and let live, I say. If they don’t choose to pedal, it’s their choice. I would much rather share the roads with them than with cars and trucks. And as I have said before – why on earth is it “cheating” to use electricity with a bike, but absolutely fine to use it everywhere else? I brush my teeth with an electric tooth brush and shave with an electric razor. When I shower, I enjoy hot water, because I have an electric boiler. And I can SEE to shave, because I have electric lights in my bathroom. I write my posts with an electricity-powered computer, not a pen and paper. I make my morning tea with an electric kettle, not a fire (which would really not work well in my condo!). The milk I put in it is fresh because I have an electric fridge. We call it PROGRESS, and it’s what we human beings excel at. Almost every aspect of our modern lives is powered by electricity. Why some people single out electric bikes and call them “cheating” is one of life’s biggest mysteries to me! Can anyone seriously believe that this electric bike is as harmful to the environment as this car? That’s my Devinci Copenhagen hybrid bike, retrofitted with one of the excellent BionX electric bike conversion kits. 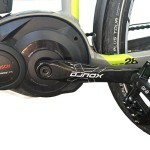 Read all about BionX electric bike conversion kits here. 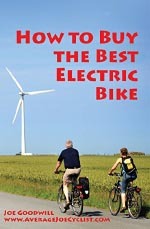 It’s true that electric bikes draw from traditional energy sources. But it’s really not fair to say that therefore electric bikes are as bad as cars. Our electric bikes use so little energy it is impossible to detect it on our electricity bills. It’s a TINY amount. Is that as terrible as a gas-guzzling, pollution-spewing SUV? I don’t think so! And the science on this is crystal clear. Electric bikes are not even remotely as poisonous to the environment as gas-powered cars. Electric bikes ARE bikes. True, many Lycra-clad athletes would not be seen dead on one. But electric bikes are bikes that make it possible for people with cardiac conditions, plastic knees, plastic hips and arthritis to cycle. They open up cycling to a massive range of relatively less able people, so that they can join the great community of cyclists and swell its ranks. 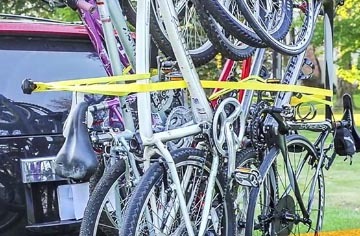 They make it possible for moms to transport their kids on bikes, not in minivans. Also, the more people ride bikes, the safer it becomes. This is just a statistical fact. Drivers become more aware of cyclists when there are hundreds of us on the streets, instead of two or three. Cities are forced to provide infrastructure – as is happening right now in London, for example, where bike superhighways are being built to accommodate the fact that the number of cyclists is rapidly increasing, while the number of motorists is rapidly declining. In fact, based on the numbers, bikes are set to outnumber cars in London soon. Between 2000 and 2014, motorist numbers in London more than halved from 137,000 to 65,000, while cyclist numbers tripled from 12,000 to 36,000. Of course, electric bikes are contributing to this rapid growth in commuter cyclists. All of this makes electric bikes something to rejoice about, NOT something to be spitting mad about.